Calorie Restriction (CR) is recognized as a scientifically proven dietary intervention to prolong life span. Many people have looked at the graphs in the book by Walford showing increases of 30% in the longevity of mice, and they have decided that they too would like to live to an age of 104 instead of just 80. They learn about Calorie Restriction with Optimum Nutrition (CRON) and they start starving themselves in a controlled way to get rid of the extra fat and keep their glucose levels down. Unfortunately, many of the promoters of Calorie Restriction diets frequently do not emphasize the stunting effects of the lower calorie diets. Mice started on 40% CR at 9 weeks, when they are weaned, may increase their life span by about 30%, but the lower level of nutrients basically halts the growth of the mice so that at maturity they only reach half of the weight of the control mice. The graphic above illustrates the corresponding relative weights of humans at different levels of caloric restriction assuming that the relationship of weight and CR is linear. If a control human weighed 150 pounds, the 40% CR human would weigh 75 pounds. Using human growth charts, we can estimate that the human control would be approximately 69 inches high, and the 40% CR human would be 57 inches tall. The more aggressive human calorie restriction practitioners (CRONies) have found that the lower calorie diets decrease their bone structure, causing signs of osteoporosis. Unlike the mice which are started at a young age and can adjust their growth to the level of available nutrients, severe calorie restriction started in adulthood requires the body to decrease in size. Clearly, if the cell metabolism cannot adjust to the lower calorie levels, something in the body must shrink. Studies have shown that the basal metabolic rate can decrease by approximately 16% for metabolically active tissues. Higher degrees of calorie restriction started in adulthood have the potential of causing severe structural damage, and a longer life is not guaranteed. I feel compelled to make a comment on the graphic. Assuming that one started CR after having grown to one's full height, say at age 22, wouldn't the height remain the same? Therefore the growth that CR would stunt would be in the horizontal (X and Y) directions, rather than the vertical (Z) direction in Cartesian coordinates? This would mean that the figures, if they were of adults, would be the same height, but their width smaller? Arturo is right. The illustrations above are of perfectly proportioned silhouettes which would be produced as a result of normal development. The decrease of an adult body frame through undernourishment would first be evident in the reduction of muscle tissue because bones are more resistant to modification due to their mineral content. 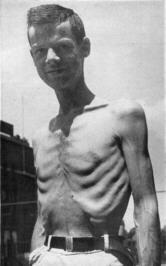 The first stage (acute undernutrition) might produce gaunt bodies like those of the WW II concentration camps or Keys' Minnesota experiment (right). The second stage (chronic undernutrition) would cause decreased bone mass with related clinical conditions like osteoporosis and its consequences such as kyphosis. The result of severe long-term CR started in adulthood is likely to be a crooked gaunt body, rather than the well proportioned bodies illustrated above.